Styling a rental can be challenging, even for those who are immersed in design 24/7—like House Beautiful editor Danielle Tullo, who was tired of coming home to a plain-Jane apartment. 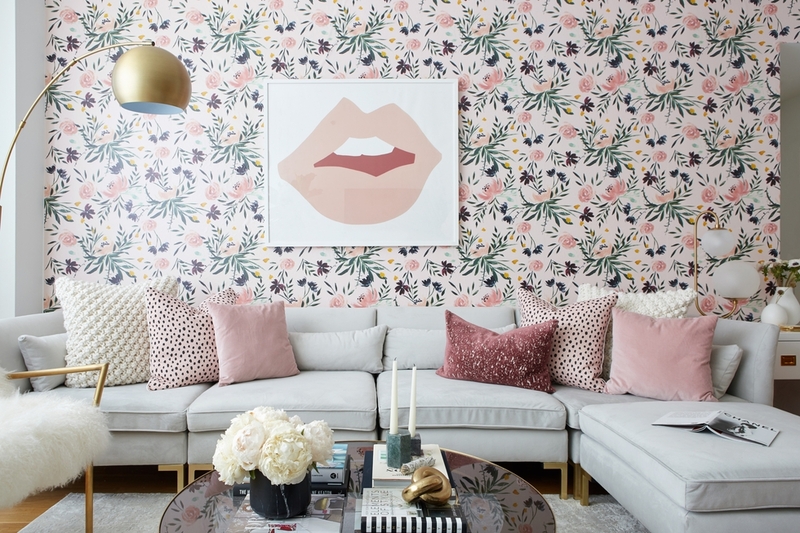 The living room was the perfect place for Decorist Creative Director Jessica McCarthy to bring an element of Danielle’s feminine, modern personal style that played well to Jessica's own blush and brass-loving vibe. Though the space initially lacked character, it did have plenty of potential. A large window let in lots of natural light, the small layout still had enough room for full-size furniture, and there was a large wall that was practically made to be a focal point. Read on to see the full transformation and all the sophisticated Bed Bath & Beyond pieces that made the space shine. And through tomorrow save 60% on a Classic or Elite design service with promo code RETROGLAM—that's just $299 $119/room for a Classic design or $599 $239/room for an Elite design! As you can see Danielle's place was a drab, non-descript apartment that was in desperate need of Decorist makeover. One of the first things Danielle wanted to address was the window area and how to mask the heating unit. Jessica came up with the idea of creating a drapery wall to cover the entire width of the wall adding texture and architectural interest to the room. She selected simple white linen drapery what would allow for heat and natural light to seep through. The long wall in Danielle’s apartment was an asset, but one that wasn’t realized until Jessica added a splash of color and pattern. 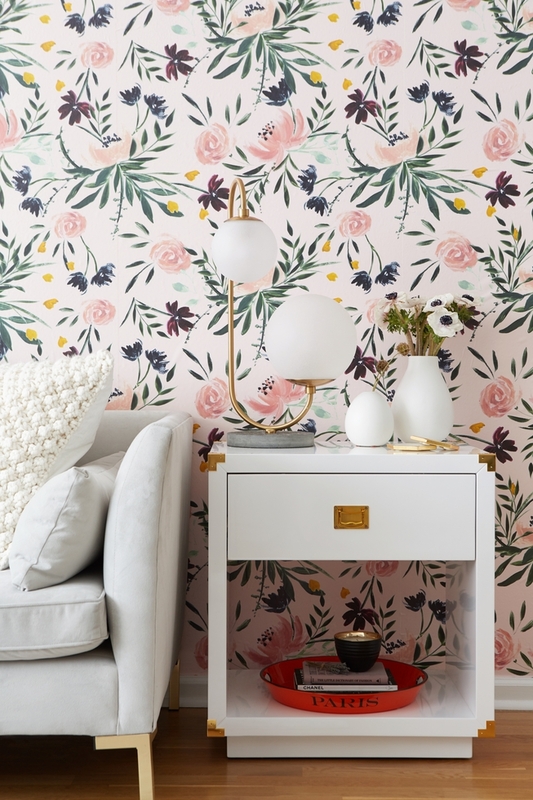 While traditional wall coverings (and even paint) are usually a no-go in a rental, a non-permanent adhesive wallpaper, like this one from Etsy, provides the perfect temporary solution. 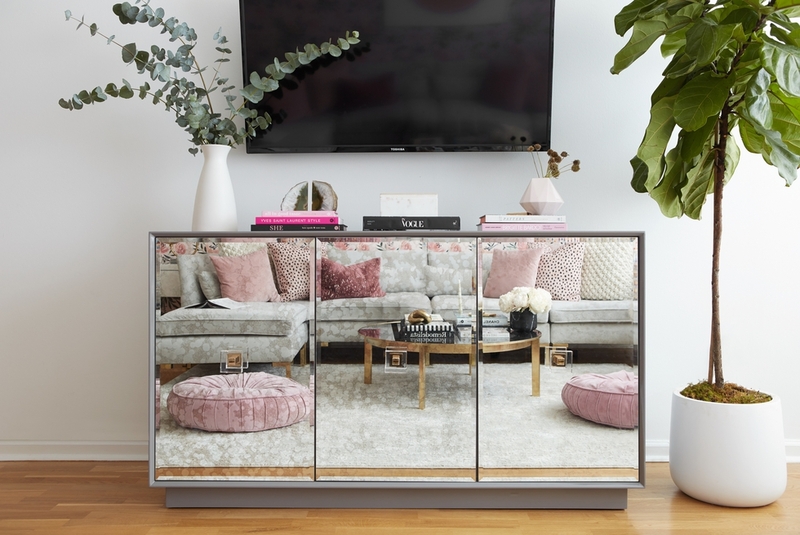 The pink floral pattern not only added an eye-catching element to Jessica’s design, but it also helped create a color palette that guided the rest of the makeover. 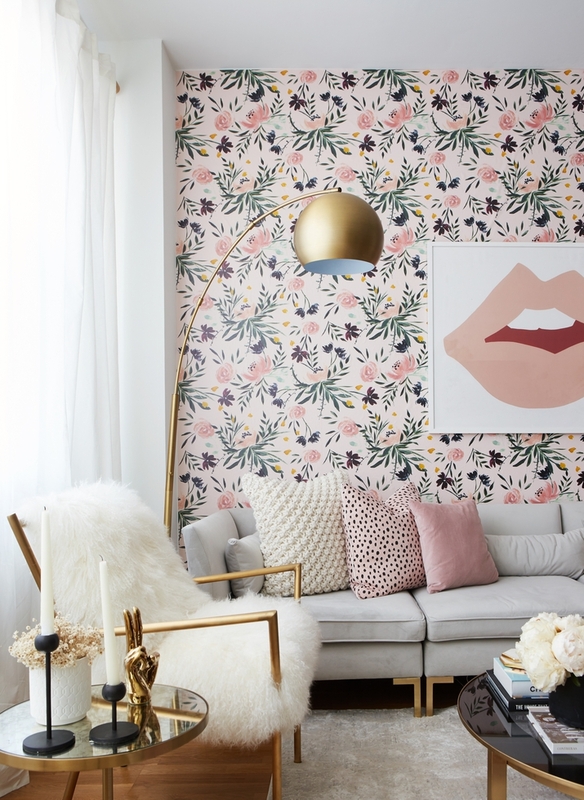 The bold lip art echoed the soft hues of the blooms while revealing a designer trick to hanging graphic art on a patterned wall without creating a distracting look: Just make sure the pattern or design of each element has a different scale. A sectional sofa in a solid, neutral hue anchors the living room without competing with the statement wall. While many renters wait until they purchase a home to buy a sectional, this particular design couldn’t be more rental-friendly. The sofa has a modular design that can be configured in a number of ways, giving Danielle options for her next home (and the next, and the next…). The velvet upholstery and metal legs also added a luxurious feel to the space. 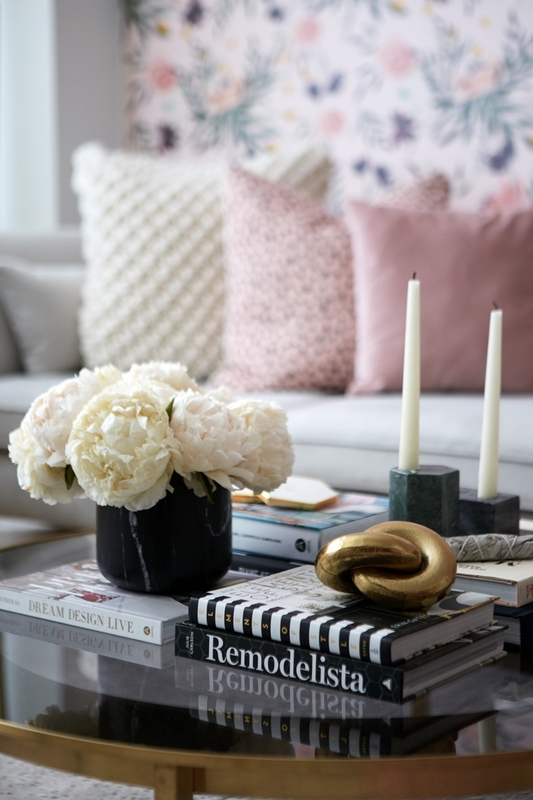 Going with a subtle hue allowed Jessica to incorporate color with pillows that picked up the hues in the wallpaper. Jessica defined the seating area with a white rug that had a hint of silver and subtle abstract pattern, giving it a depth that felt similar to the velvet upholstery of the sofa. Texture also guided the choice of the two accent chairs (featuring fun sheepskin-covered cushions) and two floor pillows. With all the soft textures within the seating grouping, a sleek glass coffee table provided just the right contrast. The gold tone legs also coordinate with the chairs, the legs of the sectional, and the lamp. In a small space, extra storage is a must — but the challenge is making that extra storage fit into the small space. White lacquered side tables have a petite scale that won’t take up valuable room, offering a surface for a table lamp and an extra drawer for stowing away odds and ends. Another area to add in storage? A console. Jessica chose a three-door sideboard that had clean lines and a mirrored finish that reflected light (creating the feeling of more space). This storage piece also visually balanced the wall-mounted television. Jessica created an entertaining area with the addition of a bar cart, which presented the perfect opportunity for Danielle to learn about the “rule of three.” This styling trick involves grouping items into threes, an arrangement that’s naturally pleasing to the eye. 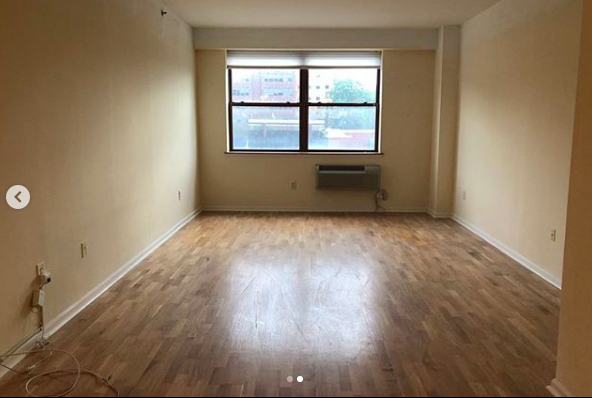 Since Danielle’s apartment didn’t have a formal entryway, Jessica created one by simply adding a bench to an empty wall near the dront door. Above, a round mirror breaks up the straight lines of the wall and bench, while creating a place for Danielle to do a final look before leaving the house. Feeling inspired by Danielle's makeover? Start a Decorist design service today to affordably transform your home into a refined retreat that suits your unique style and budget. Through tomorrow, save 60% on a Classic or Elite design service with promo code RETROGLAM—that's just $299 $119/room for a Classic design or $599 $239/room for an Elite design!